With a foot print of less than 5.5" wide x 4" deep and a weight of just over one pound, the Vox MV50 Series offers an innovative redesign to the traditional guitar amp head. In addition to being ultra-compact and lightweight, the Vox MV50 Series offers a revolutionary hybrid circuit design that combines a 50 watt RMS Class D solid-state power amplifier section with a preamp powered by a modern version of the classic 12AX7 vacuum tube, the Korg "Nutube." The preamp section of most tube guitar amplifiers include at least one 12AX7 tube. The 12AX7 is often described as a "dual triode," meaning that it includes two separate circuits for amplification. Each of these triodes has three elements: a cathode, control grid and an anode. Amplification occurs when a flow of electrons from the cathode passes through the control grid to the anode. A filament wire located near the base of the tube heats the cathode to start this flow of electrons. Korg has been a leading manufacturer of portable keyboards since the early seventies. Most modern Korg keyboards incorporate a vacuum floresecent display (or VFD) that offers a visual indication of the sound that is loaded and ready to play. Korg discovered that a vacuum florescent display could be configured as a triode, complete with cathode, control grid and anode, to create amplification. After years of research, Korg developed the dual triode Nutube 6P1 vacuum tube (seen at lower left). 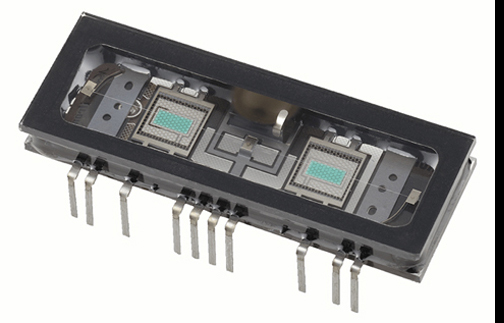 It utilized new technologies derived from vacuum florescent displays that would allow the Nutube 6P1 to perform the same functions as a traditional 12AX7. 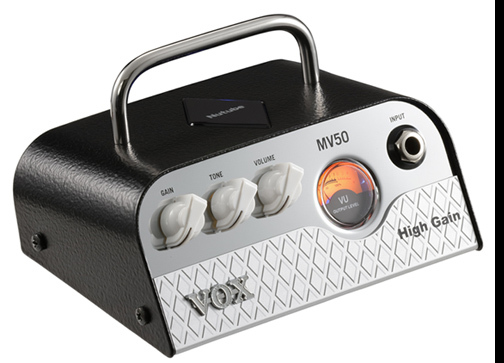 The preamp of all of the Vox MV50 Series amps utilize the Korg Nutube 6P1 vacuum tube. This gives the MV50 Series the ability to offer the rich overtones of a traditional vacuum tube without the need for periodic replacement. The turquoise glow of the Nutube 6P1 can be seen a diamond shaped window in the top of the amp case. Introduced in January 2017, the MV50 Clean provides a natural, undistorted "black face" tonality with plenty of headroom. The front panel of the MV50 Clean includes a VU meter, single ¼" input jack and volume, bass and treble controls. The rear control panel includes a head phone and line out jack plus an EQ switch that toggles between "Flat" and "Deep" response. Also introduced in January 2017, the MV50 AC serves up the classic chime of the Vox AC-30. 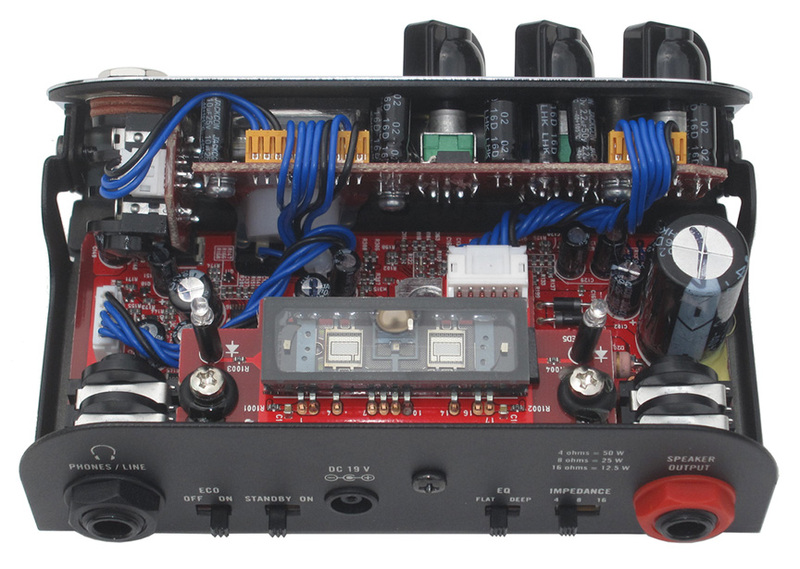 The front control panel of the MV50 AC includes a VU meter, single ¼" input jack and gain, volume and tone controls. The rear control panel includes a head phone and line out jack plus an EQ switch that toggles between "Flat" and "Deep" response. Yet again introduced in January 2017, the MV50 Rock serves up more aggressive rock tones reminiscent of British stack amplifiers. The front control panel of the MV50 Rock includes a VU meter, a single ¼" input jack and gain, volume and tone controls. The rear control panel includes a head phone and line out jack plus an EQ switch that toggles between "Flat" and "Deep" response. Introduced in January 2018, the MV50 Boutique emulates the sound of a legendary boutique amplifier loved by many guitarists. 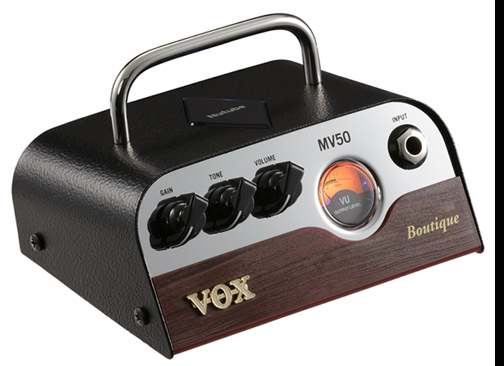 The front control panel of the MV50 Boutique includes a VU meter, a single ¼" input jack and gain, volume and tone controls. The rear control panel includes a head phone and line out jack plus a two position EQ switch. Also introduced in January 2018, the MV50 High Gain is optimized for high gain "metal" tones. The front control panel of the MV50 High Gain includes a VU meter, a single ¼" input jack and gain, volume and tone controls. 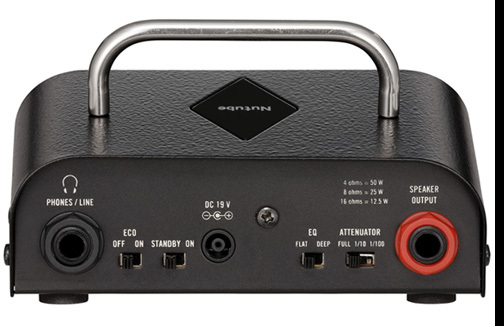 The rear control panel includes a head phone and line out jack plus a two position EQ switch. All of the MV50 models utilize an external 19 VDC, 3.42A external power supply.